Let me start this by telling you I am not a long distance motorcycle rider, but I do love to take a trip once in a while. 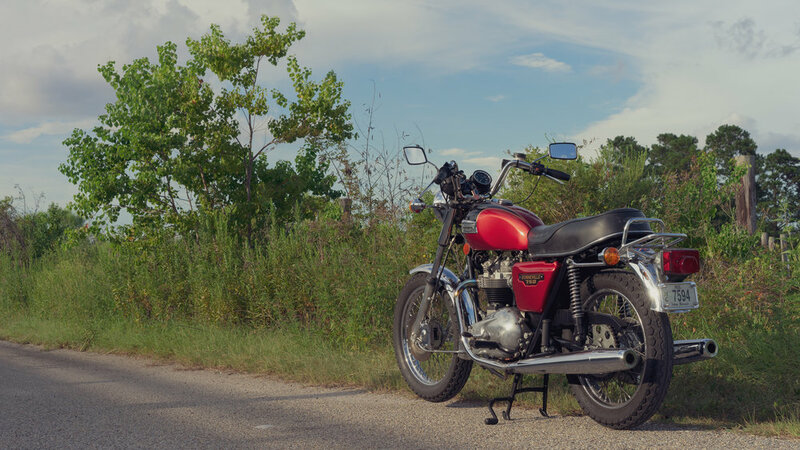 Most of the rides I do are usually with George French, who introduced me to motorcycles in about the 9th grade when I traded my Schwinn Varsity for an old 305 Yamaha that he had acquired. George and I had been kicking around the idea of a trip on two Triumphs, my '73 Bonneville and his '79 Bonnie T140;. His bike is in pretty much all original condition, mine is somewhat a custom. We started planning a trip to North Mississippi to visit some old haunts from our college days when George informed me his only free time was the week between Christmas and New Years when his shop is closed for the holidays. At this point it was "let's get these old bikes ready for the road." After oil changes, spark plugs, and other maintenance, we met up at French & Sons' shop early on Friday morning of New Year's Weekend. It was a balmy 36 degrees in Gulfport when we got ready to leave. I thought I was prepared for the cold with double long johns, toe warmers, glove warmers and everything in between all topped with leathers. George appeared to be similarly equipped with textile jacket and pants. He seemed unfazed by the frigid wintry conditions! We left the shop headed north to Wiggins on old Hwy 49 where we stopped for our first cup of coffee and a biscuit when I realized how terribly cold it really was. After warming up, we rode further north to our next stop in Richton up Hwy 29 through the Desoto Nat'l Forest. By the way, the further north we traveled, the colder it got. During this leg of the trip, I noticed George's headlight on his old Triumph off going thru town but on while on the highway. We made it to Richton where we hit Hwy 15 on to Laurel. At a lunch stop for burgers and fries in Enterprise on Hwy 11, I asked George about his headlight. At this point, George confessed that he had plugged in his heated gloves and boots from his touring bike into the ancient Triumph's electrical system (which puts out a massive 10 amps). Imagine my shock when I discovered that George was riding in relative comfort while I suffered from the elements! No wonder he was unfazed by the prospect of riding in the cold! We continued northward up Hwy 11 to Meridian where I thought we could easily navigate to Hwy 39 N; however, it was not as easy I thought and were lost in downtown Meridian. We had to backtrack to I-20 to go a couple of miles out of our way to reach Hwy 39 N.
Once on Hwy 39 N, past the Meridian Naval Air Station, we experienced the real section of Hwy 39 that is a fabulous, scenic road. We rode thru Daleville and DeKalb finally ending up at Shuqualak, the terminus of Hwy 39 at Hwy 45. Getting dark, we rode north to Macon on Hwy 45 and spent the night at the Oak Tree Inn. After a couple of margaritas at the Mexican restaurant next door to the inn, George commented "we should do this every year." Sunrise brought with it the challenge of kick starting my 45 year old Triumph in 32 degree cold!! After working up a sweat, we finally got the bike running but paid for it on the ride north to Columbus as we rapidly cooled off. In Columbus, we visited with my brother and his wife (who had never been on a motorcycle in her life), warmed up with a big breakfast and headed south trying to beat the ice storm that was headed south into Mississippi. We made it all the way back to Meridian when a broken throttle cable sidelined us north of town. Despite George and myself trying to imitate McGyver, we couldn't make the repairs needed to get the old bike running. George and I were stranded when out of the blue a young Royal Navy pilot from Scotland stationed at Meridian Naval Air Station pulled up and offered assistance. He was the greatest. Chris and his wife drove me to U-Haul. 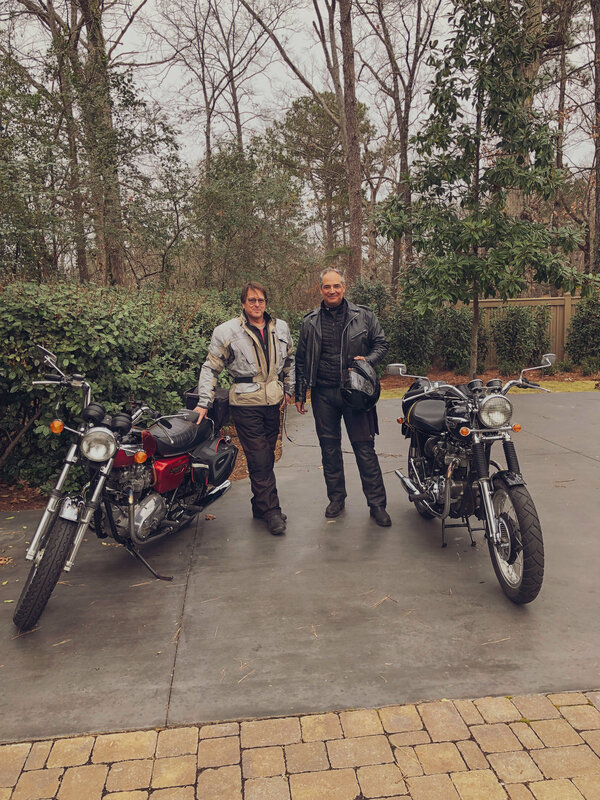 We rented a van, loaded both bikes and headed home (I told George that we would probably sling a rod if we both doubled up on his old Triumph). To cap off our trip, which was 349 miles to the break down, we stopped at Pappy's BBQ and thoroughly enjoyed a pulled baby back rib sandwich which was most satisfying at the end of a long, cold day!! (1) You can ride in the cold with no windshield on a vintage bike. It's all about layers (unless you are George) and we found that 60-75 miles a stretch was no big deal. 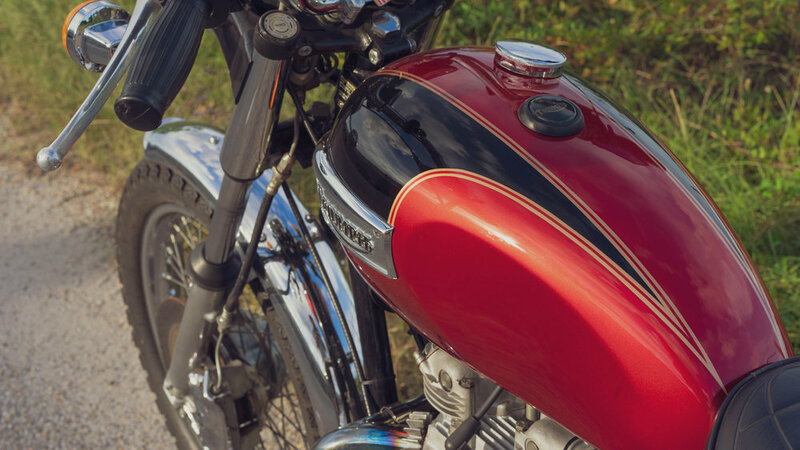 (2) These old bikes average 35-45 miles per gallon so you do have some range. We kept our speed at about 60-65 mph so as to not stress the old bikes much. (3) The fun of this type of trip is enjoying the scenery and the fabulous gas station food you can find!! Get out there on your bike and enjoy! !